The entire India and Indian expats scattered around the world busy making preparations for Gowri-Gaesha festival of beloved Hindu elephant headed God Ganesha, the story at Monsoon Spice household is rather sad and quite different! With Lil Dumpling suffering from high temperature, both HD and me are taking turns in taking days off from work and looking after our precious little one. It’s been just 3 days and Lil Dumpling has lost oodles of baby fat! Every parent I have met had said the same story! ‘Let him turn 2 and his immune system would be so much better to fight off nasty bit of cold, fever and other viral infections!’ It’s been little over 2 months since he turned two but the viral infections are still fond of him as before and it may take few more years for LD’s little body to fight off these nasty bugs! Although he looks rather frail and thin, we are amazed by his never ceasing energy. To make him sit in one place and rest is something I have categorised as rather ‘impossible’ things to achieve! But when his little body burns like a fire, I feel helpless and confused and the usual ‘why my Lil Dumpling’ surfaces with vengeance! There is no answer and I literally shrug off and move on caring for the precious bundle of joy, fun and mischief in my hands! With everyone in our family and friends circles busy celebrating the Ganesha festival, I am being asked by loved ones regarding our preparation for our beloved God’s special day. Every year I come back from work all tired and exhausted and still enter my kitchen with all the enthusiasm to cook something special for my beloved elephant headed god. But this year it is a different story. I am not really in a mood to celebrate the festival this year, but we may just do something small for Lil Dumpling’s sake. Every morning he enters the Pooja room with his Appa and sits in front of small Mandir folding his tiny dimpled hands and serious frown on his face as his dad chants few Sanskrit Shlokas. Every evening he sits on my lap as I light the Diya and incense stick that spreads the fragrance around our home, and he smiles at me when we sing few Bhajans clapping our hands. Soon he will ask the meanings of the Shlokas we chant and the Bhajans we sing before bowing our heads in front of Gods and Goddesses sitting prettily in our small Mandir and get a glimpse into the mighty power of prayers. I can already see that as he grows, his curiosity grows and the need to know the reason behind every simple action is showing up with liberal use of ‘why?’ thrown at us every now and then! So we will celebrate the special day or Lord Ganesha in simple way for Lil Dumpling to keep his curiosity burning. If I do end up cooking something special, I will try to take few photos and note down the recipe to share with you all my dear reader friends. But till then, we three from Monsoon Spice home wish you all a very Happy Ganesha Chaturthi! Wishing you happiness as big as Lord Ganesha’s appetite, life as long as his trunk, trouble as small as his mouse and moments as sweet as his laddus! 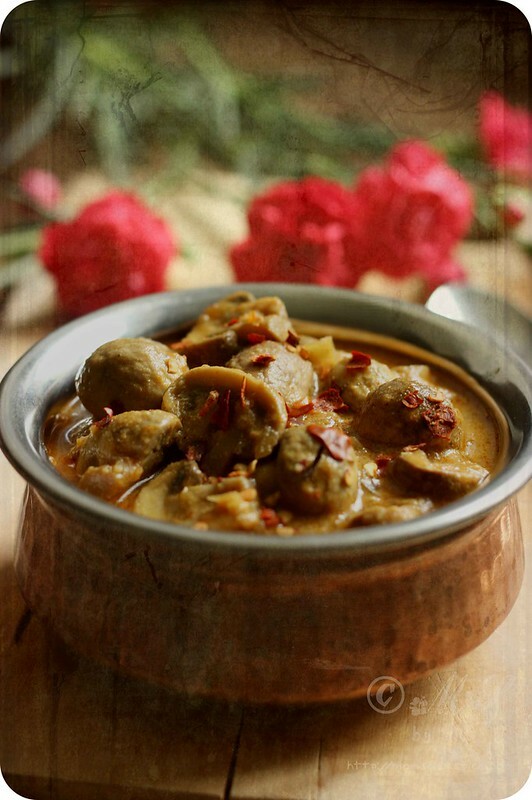 Before I bid you adieu, here is the recipe of Dahiwale Mushrooms as I promised on Monsoon Spice Facebook page! 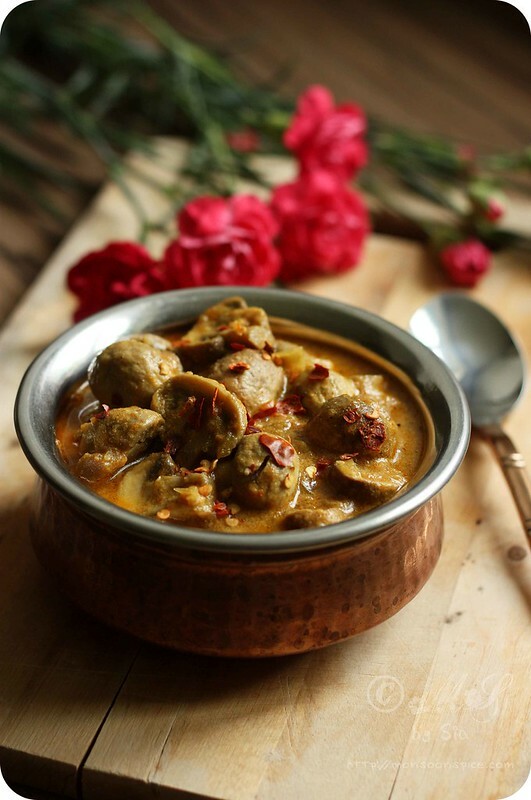 This recipe is adapted from my dear friend Vidya and I honestly felt it to be one of the simple, easy and delicious recipes of mushrooms I have tasted in a long time. In my eagerness to recreate it in my own kitchen, I jotted down the recipe from Vidya in a hurry and made few mistakes of not asking the exact amount of yogurt used in the curry! 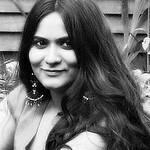 Vidya had actually used just one table spoon of yogurt but I have used one full cup of yogurt! Nevertheless, the recipe turned out really tasty and I decided to post it here for posterity! 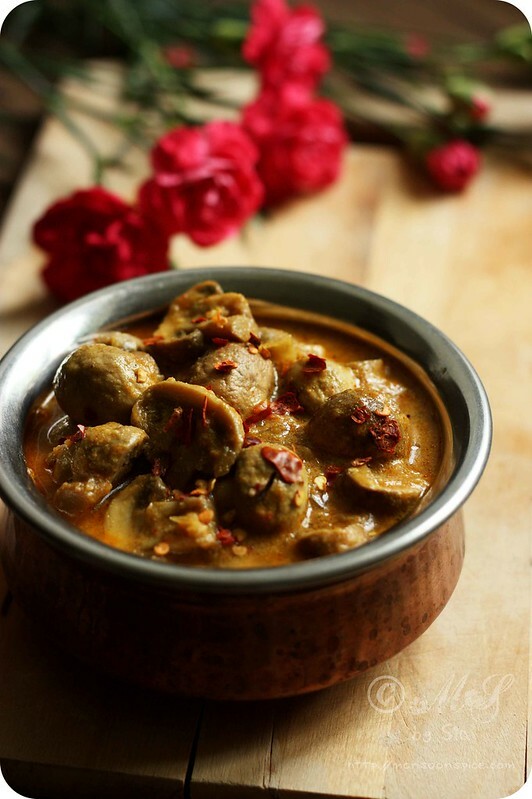 With just a handful of readily available ingredients and few simple cooking instructions, this recipe of Dahiwale Mushrooms or Mushroom Yogurt Curry is something you can whip up when you are pressed for time! 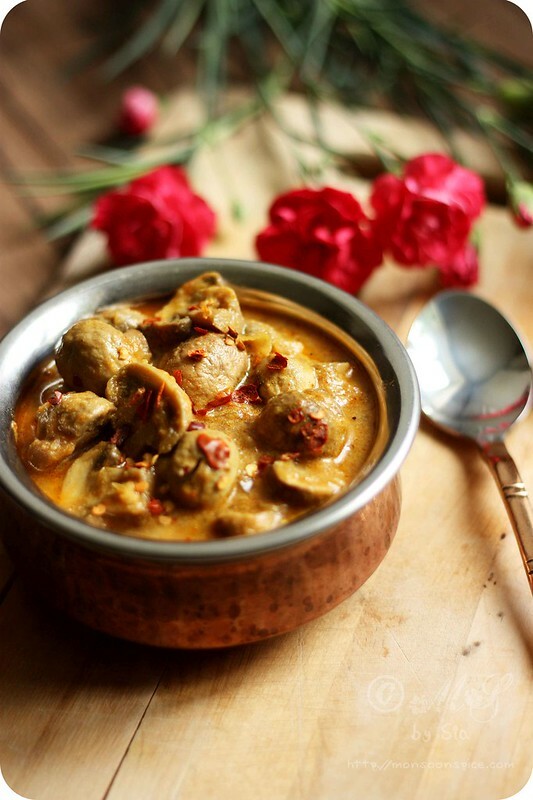 There is no fancy ingredient or complex cooking technique and hence this is a perfect recipe for beginners in Indian cooking! 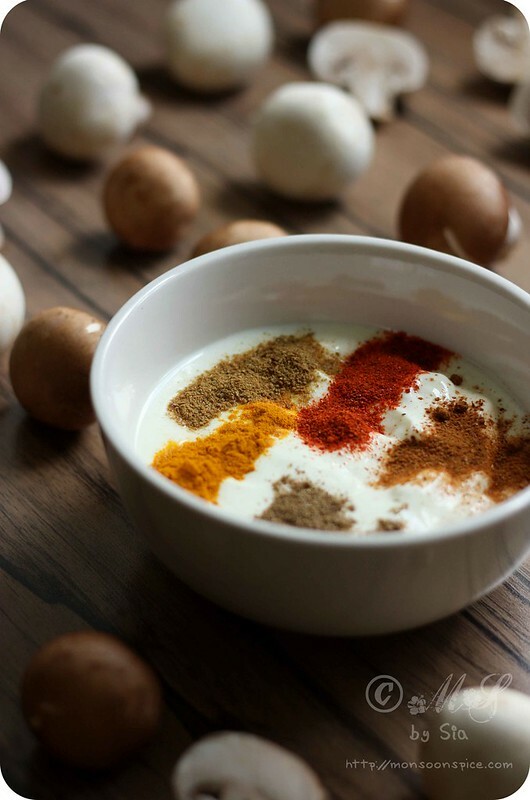 All you need to do is prepare the yogurt marinate, mix them well with the mushrooms, and cook them! It just can’t get any simpler than this! It takes around 15-20 minutes for the mushrooms to marinate and around 20-25 minutes for cooking them as it is very important to cook the mushrooms thoroughly! 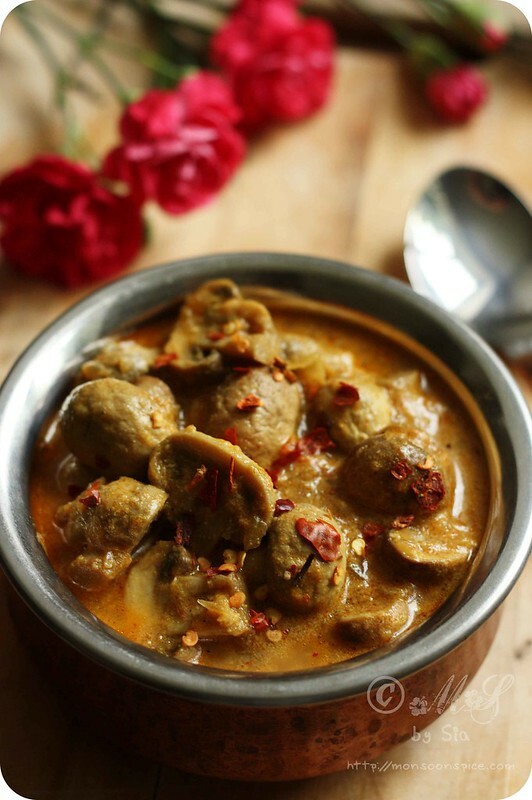 This delicious yogurt gravy based Dahiwale Mushrooms or Mushroom Yogurt Curry goes well with any Indian flat breads (Whole Wheat Naan or Butter Naan or with any stuffed parathas) or plain/flavoured Basmati rice. First prepare the yogurt marinade by whisking the yogurt to remove any lumps. Add all the spice powders listed above in the lost along with ginger-garlic paste and salt to taste. Keep it aside till needed. 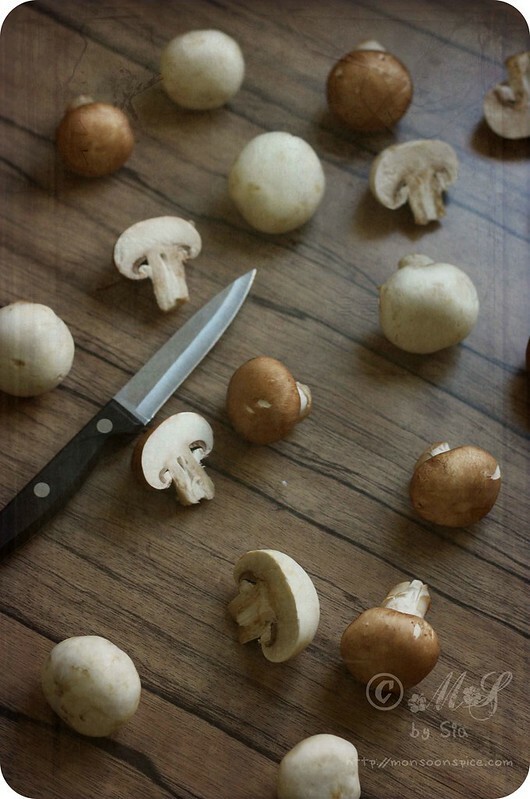 Clean the mushrooms and cut them in half or quarters depending on the size of mushrooms. Here I have used a combination of chestnut mushrooms and button mushrooms, so feel free to use any one or combination of your favourite mushrooms. 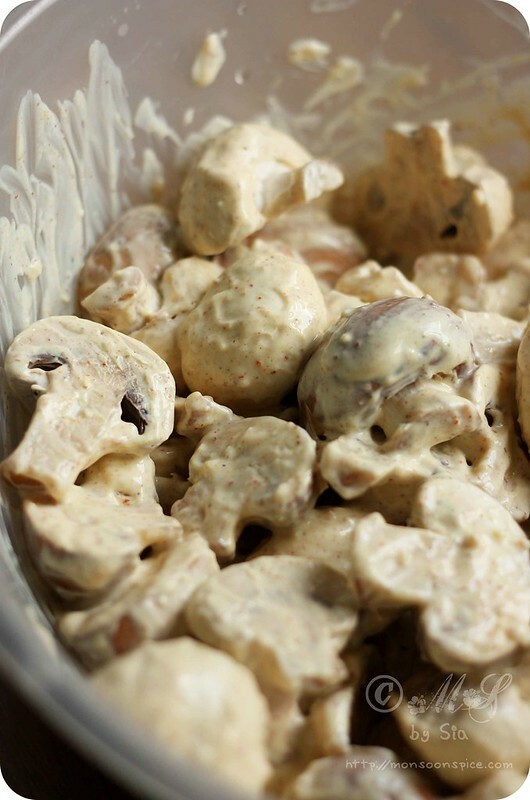 Place all the chopped mushrooms in a large bowl and pour yogurt marinade to it. Gently mix them all using fingers so that every individual mushroom piece is coated with the marinade. Keep it aside covered with a cling film for 15-20 minutes for all the flavours to blend well. Heat oil in a pan and add cumin seeds to it. When cumin seeds start to sizzle and change colour, about 30 seconds, add finely chopped onions to it. Sauté the onion till it turn golden, about 3 minutes, on medium flame. Add ginger-garlic paste and sugar and fry them till the raw smell disappears, about 2 minutes. 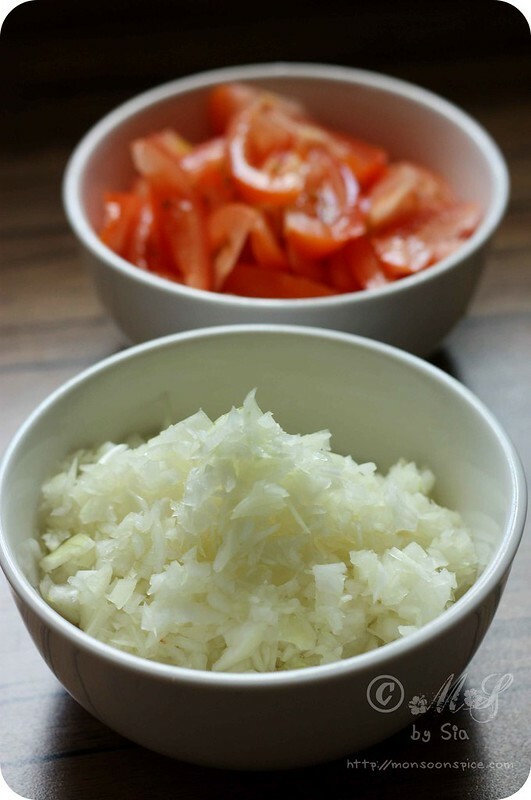 Mix in thinly sliced tomatoes and cook them till they turn pulpy and release their juice, about 3 minutes. Add marinated mushrooms and fry them till they start to release their juice. Cover and let them cook for 5-10 minutes, mixing them in between, till they are cooked thoroughly. 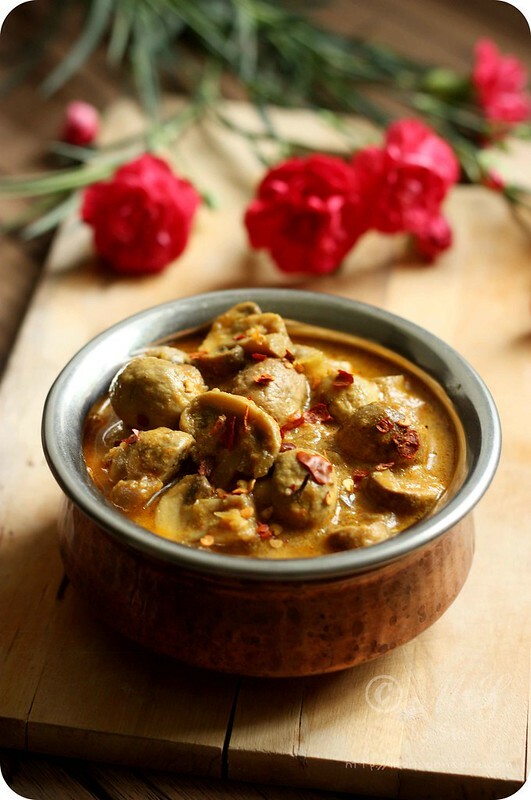 Serve this delicious yogurt gravy based Dahiwale Mushrooms or Mushroom Yogurt Curry hot with any Indian flat breads (Whole Wheat Naan or Butter Naan or with any stuffed parathas) or plain/flavoured Basmati rice. Reduce the amount of yogurt used in the marinade to just a tbsp for little dry curry. 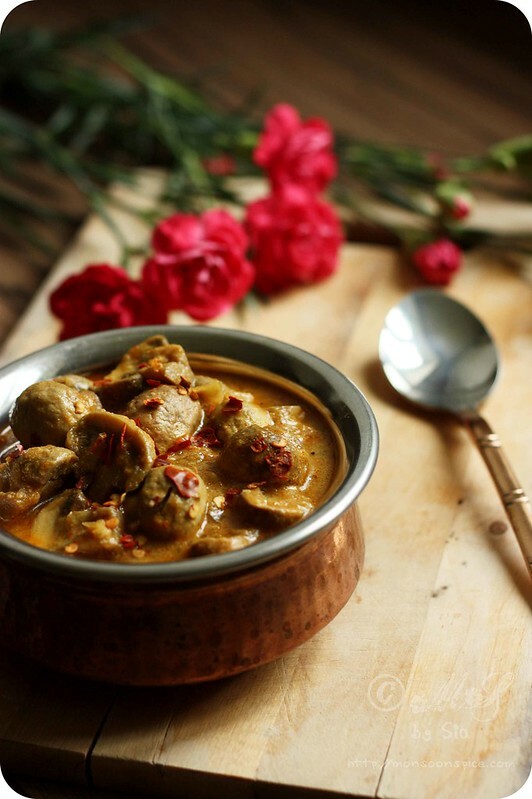 Vegans can simply skip the yogurt and use just the spice powders listed above for simple and delicious Marinated Mushroom Curry! 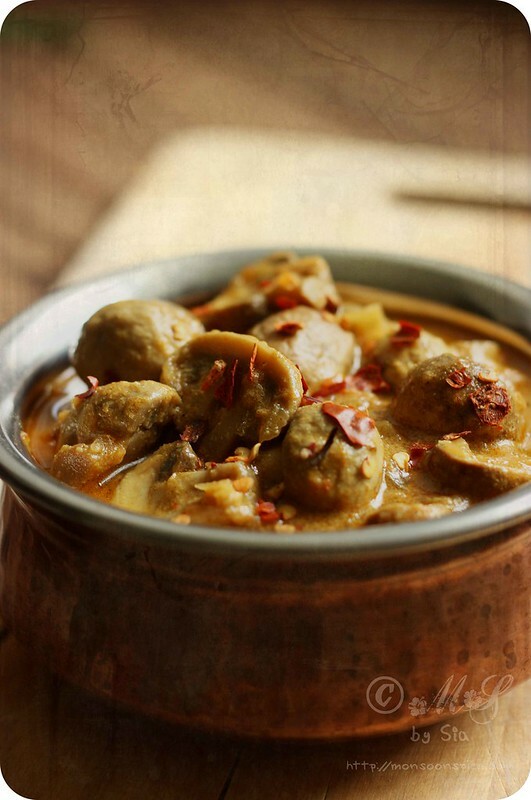 You can also add one medium bell pepper along with mushrooms to add new flavour to the curry. This dish is just simply terrific! Scrumptious ingredients and wonderful flavors. I was waiting for this recipe..cant wait to try it! This looks so good Sia! Am surely going to try it. How is little P? hmmmmmmmmmmmm I am a big fan of mushrooms and ur yogurt gravy mushrooms look so yummy and lip smacking. You made mushrooms so beautiful and lovely curry! Awww... Hope lil dumpling gets well soon! 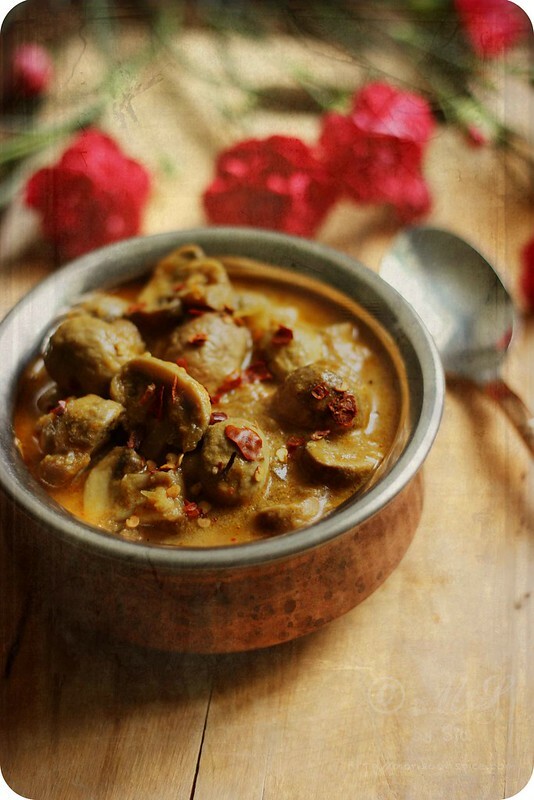 I just came across this webpage and I tried this dahiwale mushroom gravy.. it was one of the tastiest mushrooms I've had! Thank you for the recipe. Jen, 1/2 teaspoon ginger n garlic paste goes into the yogurt marinate and another half tsp in to the pan after frying the onions.